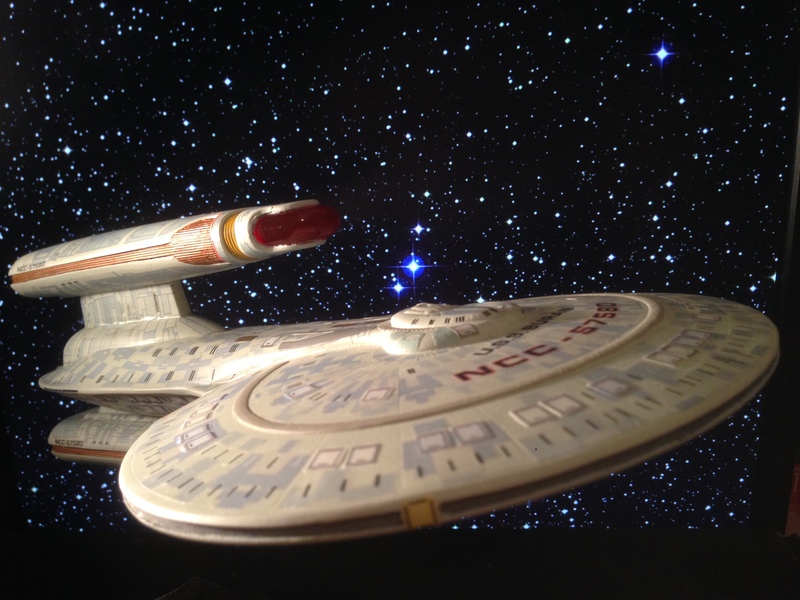 I present to you: the Enterprise NCC-1701-B! Easily one of my favorite designs. This is the Starcraft Models 1:1400 scale kit and wallpaper decals. After this one I am left with two more Enterprises. The A and the NX. This is a really easy kit, as it's only 6 parts, and, like all things Starcraft Models, the lines are crisp and clean, the fit is good, and details are spectacular. I used a base color of Vallejo Insignia White, with Vallejo Aggressor Gray for the dark grey details, Vallejo Black Gray (or is it Gray Black?) for the neck and nacelle grills, Vallejo White for the On windows, and Vallejo Anthracite Gray for the off windows. Black was just too stark of a contrast. I lost the Starcraft display that came with the kit, so Iended up using the Round 2 display instead. I kinda like it so I might end up using them for all my ships to maintain uniformity. She turned out looking great. Nicely done! For the sake of comparison, here she is next to my completed Enterprises. Wow, she looks gorgeous and that fleet looks awesome! Very well done! Are those the Starcraft wallpaper decals?